We certainly are a couple for all lodgings – from the luxurious Dayton House one night to a rustic cabin without a bathroom or kitchen the next! 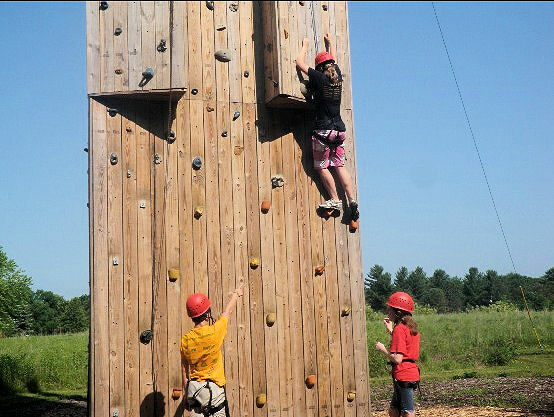 This is at Lake Shetek State Park in Southwestern MN. Linda is getting some veggies ready to stir-fry. 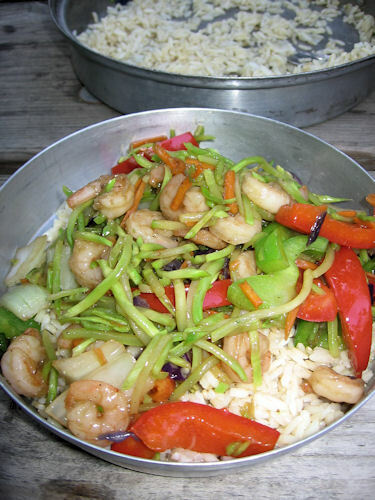 Some rice, a pack of cole-slaw mix, some peppers and onions and stir-fry mix and call it supper. 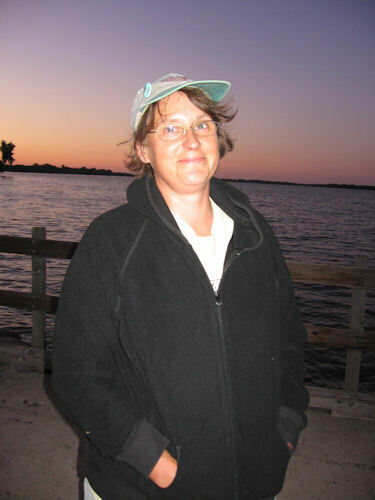 The fishing wasn’t great – while I tried hard to catch some fish, Linda opened a book, threw out a bobber and noticed her bobber was gone at one time and pulled up the only fish of the evening – aÂ walleye. I didn’t bring a book down to the lake, so I couldn’t emulate her technique and thus didn’t catch any. 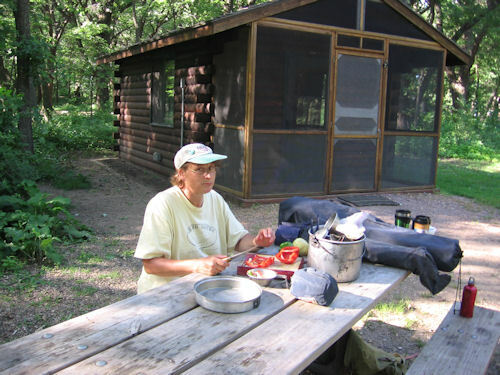 The 20th Anniversary travel junket to SW MN continues with a stop at Blue Mounds State Park near Luverne, but nowhere near Shirley, Minnesota, although it is close to Marshall. 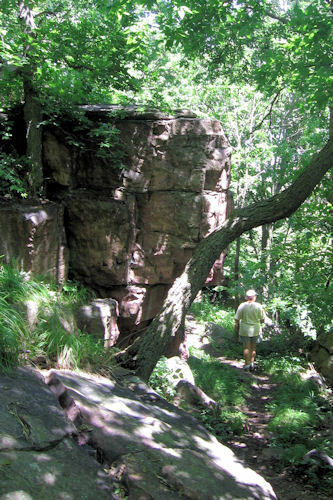 The outstanding feature of this park is the Sioux Quartzite cliffline that runs along the park. This is the view from near the top of the cliffline looking towards the east. A view from the bottom of the cliffline looking west. Again, in the middle of the flat prairies, this anomaly of billion and a half-year old rock outcrop is quite stunning to see and contemplate. 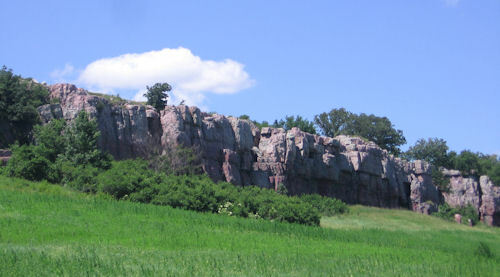 The top of the cliffline is prairie with a bison herd, but along the base is a forest of oaks on the top and other mixed hardwoods further down the cliff. 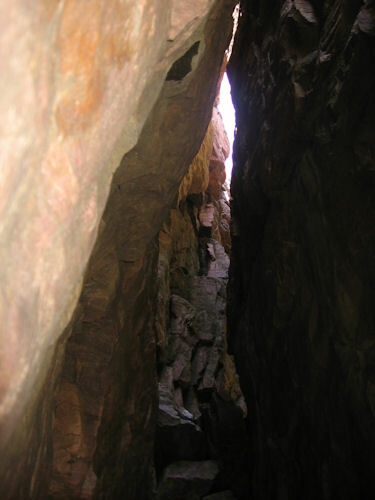 Part of the rock was used as a quarry in days gone by. Noted author Fredrick Manfred built a house at the end of the cliffline directly into the rock. 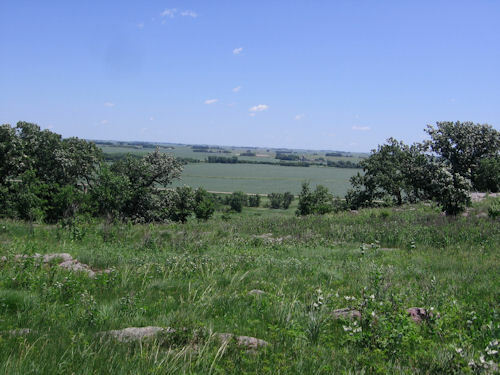 His special room was the top where there was a commanding view of miles of prairie. He wrote many books, and if I recall the info correctly, was nominated for Nobel prize for literature four times and gave the eulogy at the funeral of Sinclair Lewis. 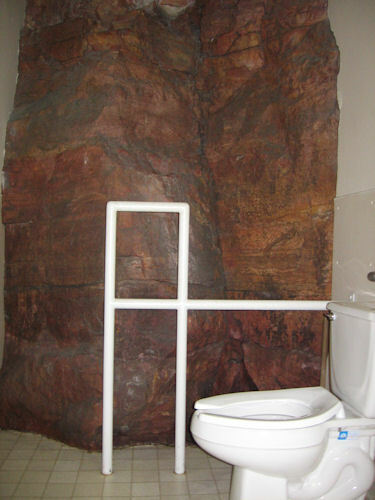 Even going to the bathroom in the house “exposed” a bit of nature. 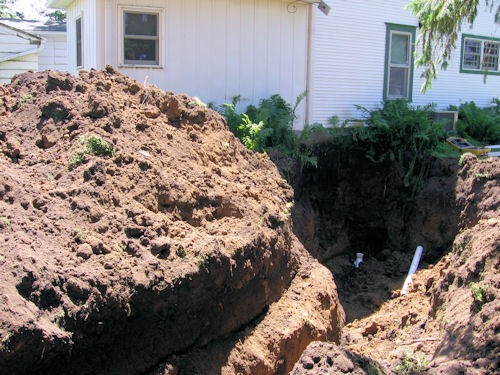 Ultimately, the house was plagued by moisture problems from seepage from the bare rock that made up one side of the house. 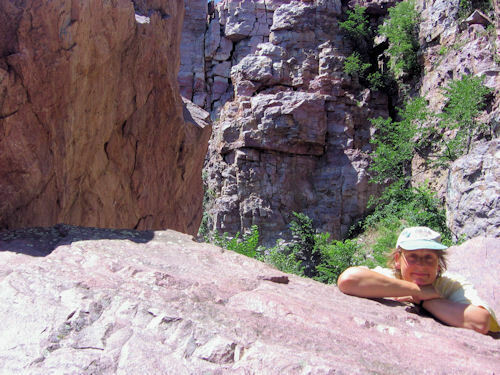 Linda admires the 1.5 billion-year old Sioux quartzite. 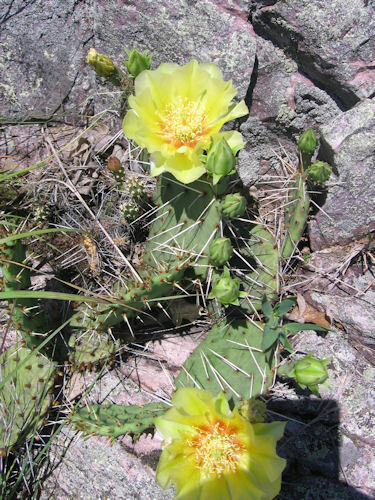 Prickly pear cactus were in bloom on the top of the cliffline. 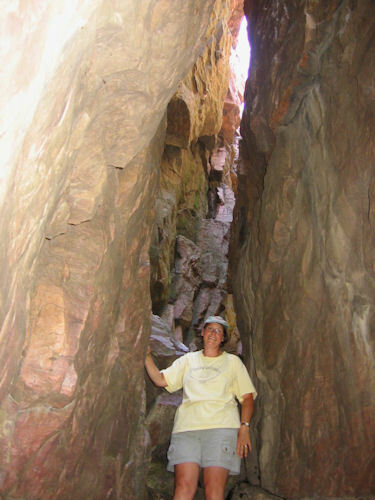 Near the bottom, all kinds of fissures in the rock make for interesting places to explore. If you restrict your gaze to the red rock fissures, you might be able to imagine that it looksÂ a bit like southern Utah and the Canyonlands country. 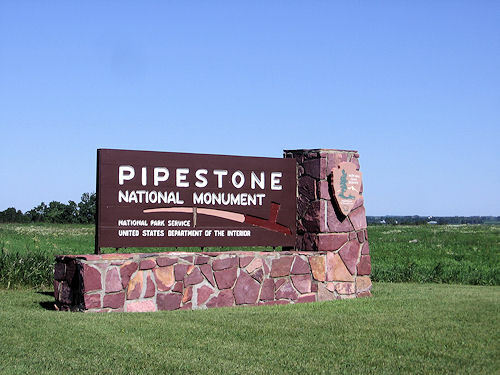 The second day of our 20th tour, brought us to Pipestone National Monument near, strangely enough, Pipestone, Minnesota. 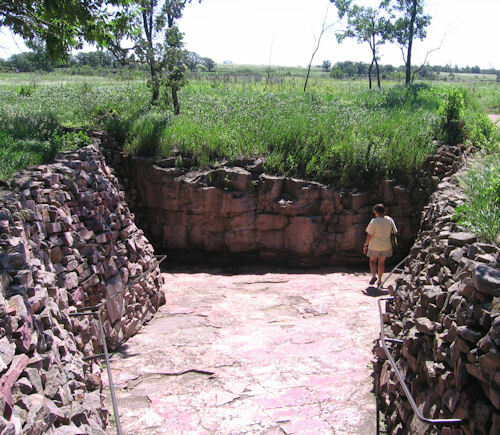 This monument interprets and protects the site of native American pipestone quarries. 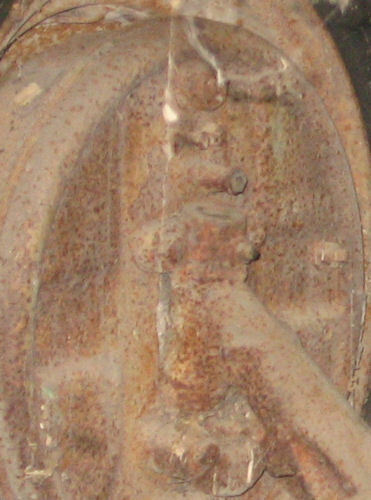 Most famously it was the stone used to carve peace and ceremonial pipes. It was a sacred site and was off limits for war and available for all tribes. They didn’t even camp on the ground when they came. 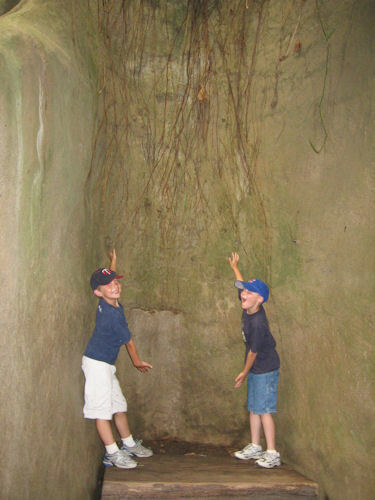 Here’s a rare shot of a waterfall in the tallgrass prairies. 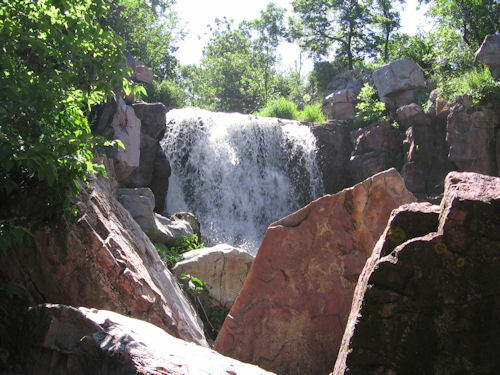 This is Winnewissa Falls along Pipestone Creek within the park, falling over a ledge of the Precambian (very old) Sioux Quartzite. Go ahead, look through for guidance! 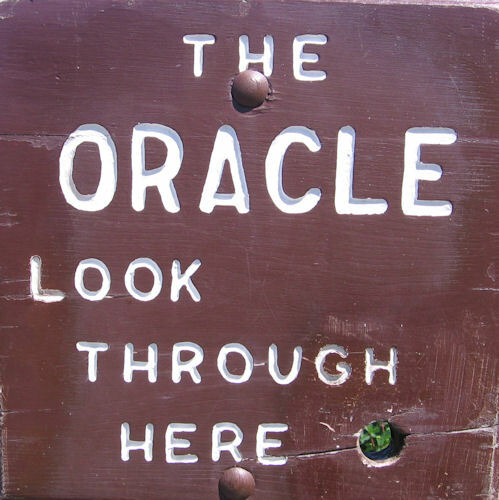 See the oracle in the rock? 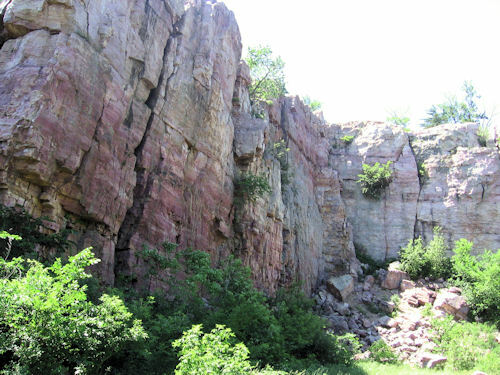 The pipestone layer is at the bottom of this small quarry – about 12 inches thick. 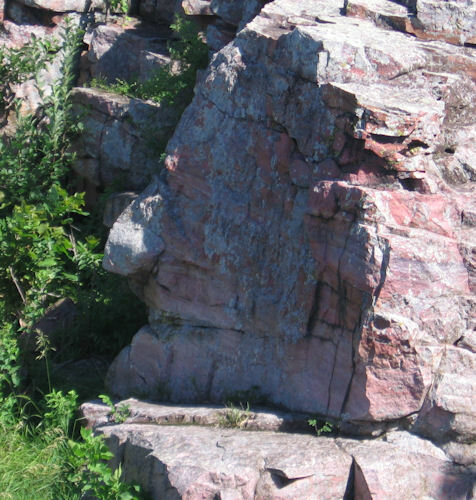 Native Americans still mine and craft the pipestone and by law are the only ones able to do so. 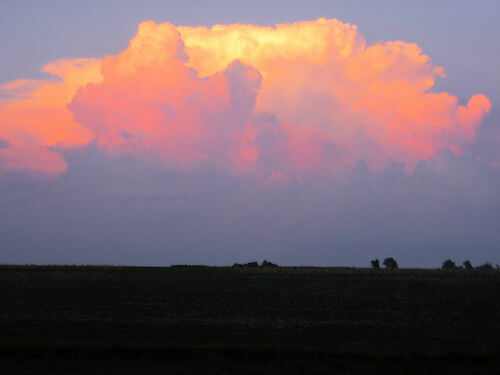 Time and $$ (see septic tank installation) prevented us from celebrating our 20th anniversary on a long trip, but we wanted to get away and note the milestone nonetheless, so we planned a trip to everyone’s favorite vacation destination, the prairies of Southwestern Minnesota! 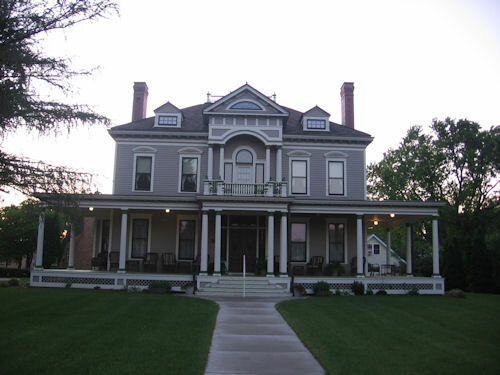 The first night, we stayed at the historic Dayton House in Worthington, Minnesota. When I booked the room, I didn’t realize it was Dayton as in Dayton-Hudson/Target. 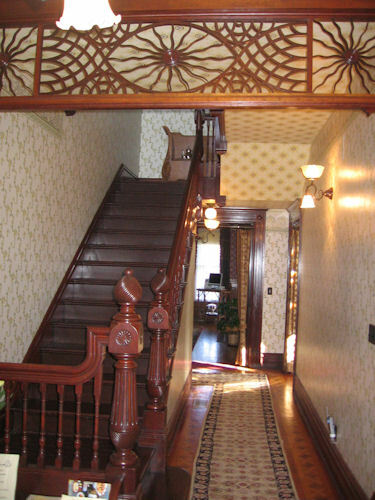 It was the family house of the Dayton family for many years before the Daytons purchased property on Nicollet Avenue in Minneapolis. 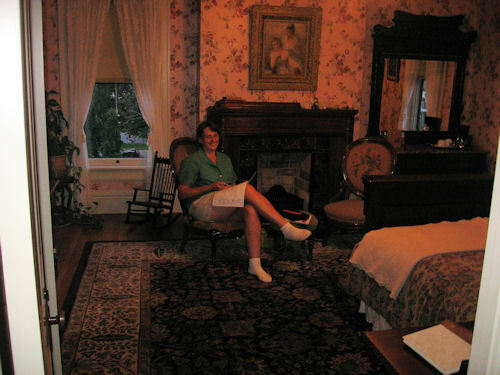 Linda lounges in one of the lovingly restored bedrooms. 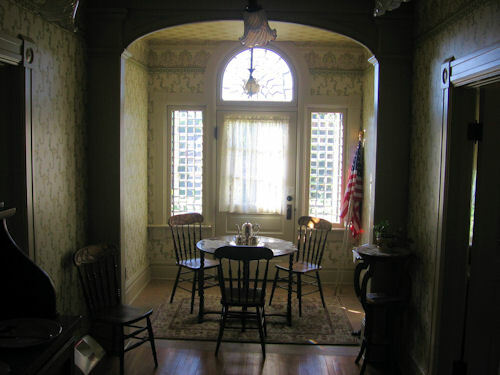 The house was restored as a joint venture of the community and the Dayton heirs. The house was a shell of its former self in 1992 when it was sold for $15,000. This staircase was walled over, which in some ways protected it. This is a small sitting area between the two suites on the top floor. Since no one else was staying at the house that night, we were offered the run of the house, including the downstairs. In addition to a bed and breakfast, the house is a great setting for showers, and piano recitals, among the furnishings a Steinway piano. 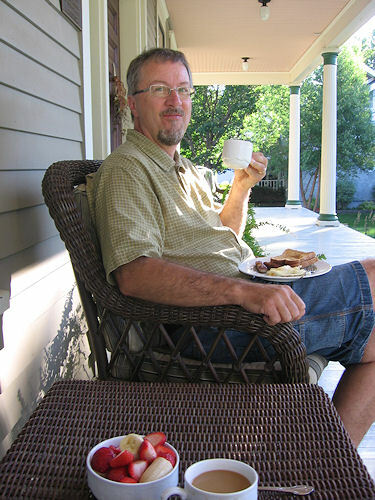 We ate breakfast on the front porch. 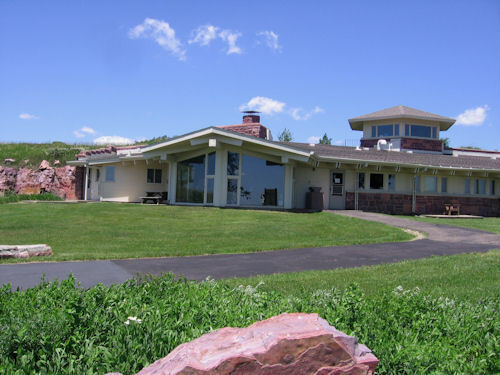 The house was a wonderful place to stay and we highly recommend it if you are looking for a getaway in SW Minnesota. You’ll never know what you’ll find in small towns, and in Worthington, we found an Ethiopian Restaurant. As we’ve never had food prepared in that style, we jumped at the chance. We found that Ethiopian food is generally served without silverware. 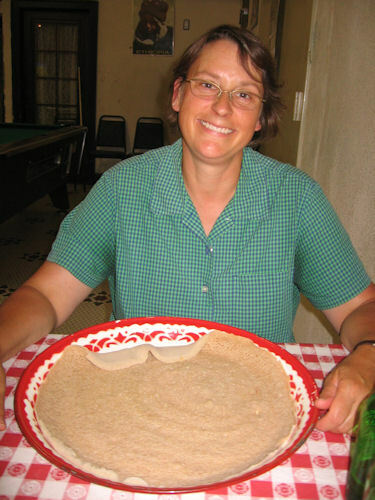 The base is this large bread/pancake-like circle and the food is brought in separate dishes and is served by ripping a section of the bread and wrapping the meats/beans/toppings in the bread. After dinner we took a walk around Lake Okabena – about a 5 mile walk. About halfway around the lake a storm rolled in and we were about three miles away from the house and were without our cell phones. 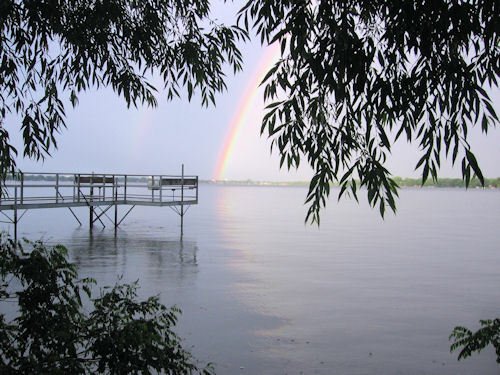 We found a picnic shelter along the lake and waited out the rain before the rainbow came. A few steps back onto the road, the host at the Dayton House was driving around the lake looking for us, because we had told her we might walk around the lake after dinner. How’s that for hospitality! 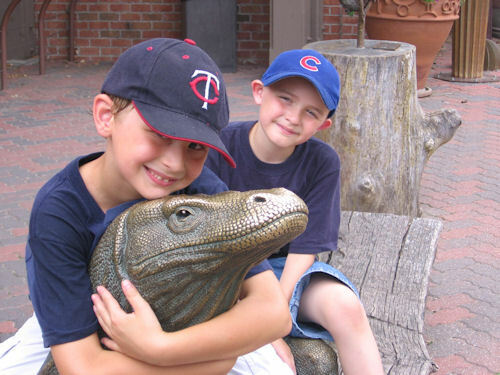 Today Martin got his birthday present, a trip to the Omaha Zoo with a friend. 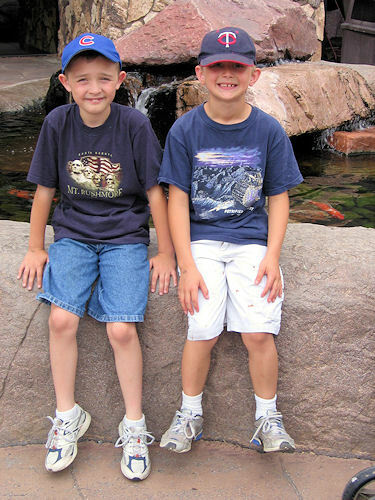 No, they didn’t call each other about what they should wear, but they look similar but different enough (Cubs and Twins hats, Mount Rushmore and Petrified Forest t-shirts). 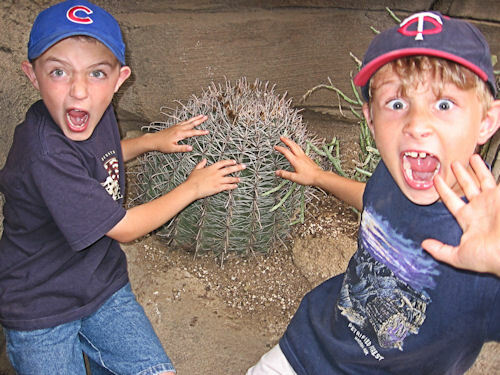 Not that seven-year old boys like to act out, but it seems like a theme for the day. Ok, we’ll ratchet up the goofing around up another notch! But we can be gentle as well. 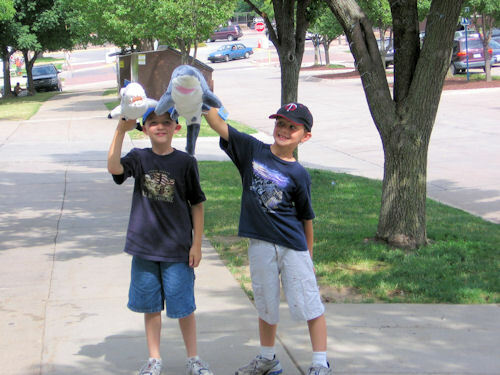 The boys after a long day at the zoo, leaving with sharks in hand. 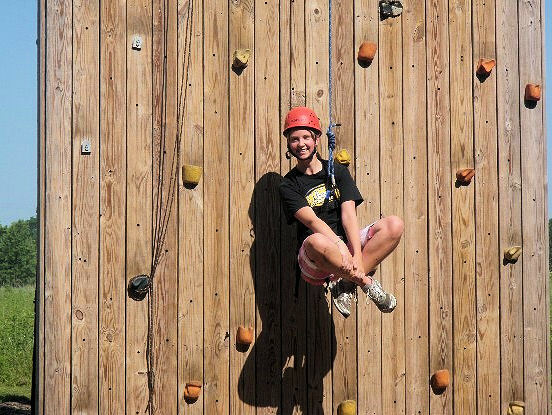 Emma’s off at camp this week and having a great time. 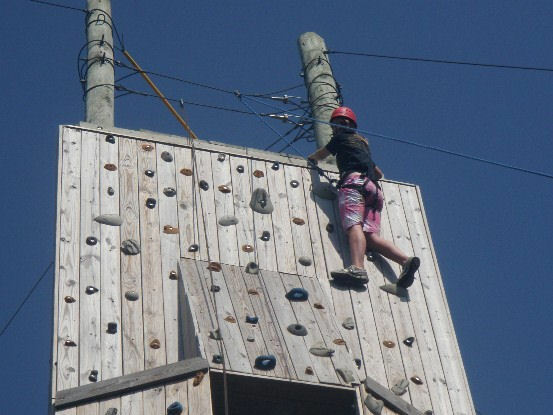 Finally she gets to hang around on the way down – more from as the week goes on. I wasn’t home today, so I missed the arrival and placement of the new tank. So, today they set the tank and finished setting the drain field. This picture of what looks to be giant mole tunnels are the four 100 foot lateral drains for the tank. These are not to be disturbed, packed, or the like and left to settle for a period of years. OK, so this isn’t the most compelling post from high hopes – there’s no luscious fruit, no animals, just a hole in the ground. Since it is impossible for me to avoid the giant gashes in the earth and piles of soil, I feel the need to share it! The old septic tank was only 500 gallons and was a few feet from the house – here’s the hole after digging it out and filling in the hole where the old tank was. The tank was deep as the basement has floor drains and the top of the tank was below the floor drains, thus a really big hole. 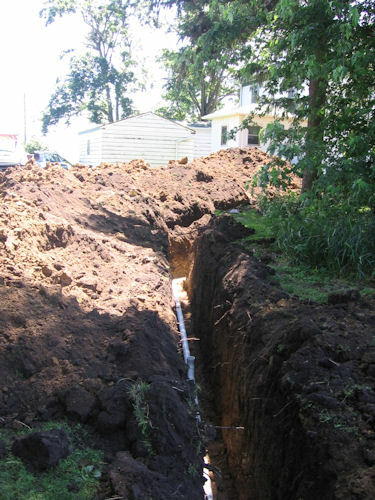 To avoid a mechanical pumping system that would be problematic to use in power outages and to avoid more mechanical things that could go wrong, to get enough grade, the new tank, approx three times bigger than the old one, needed to be a ways from the house, thus the long trench. 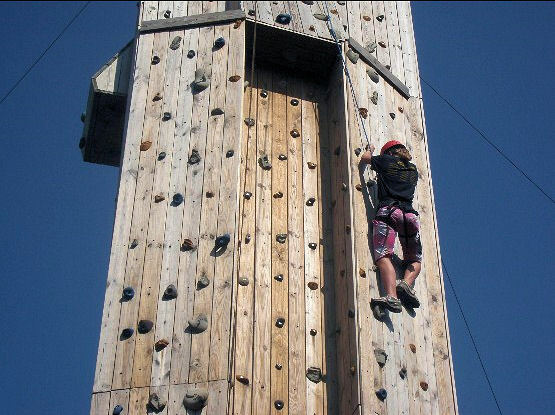 This was about it for day 1 – it was one of those 96 degree muggy Midwestern days. In the last few weeks, if we’ve gone 12 hours without rain it was a relief. Yesterday was no exception, although we lucked out in the afternoon as the storm clouds billowed up literally right over our farm. 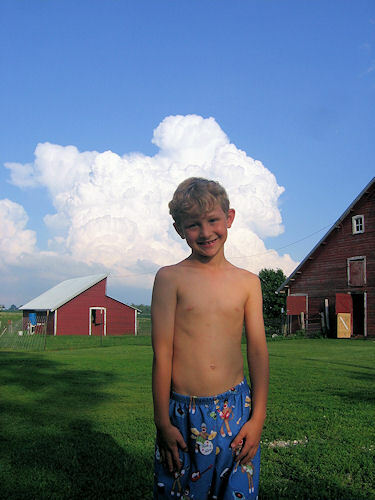 Martin and I watched, lying on the ground as this cloud billowed high into the sky. 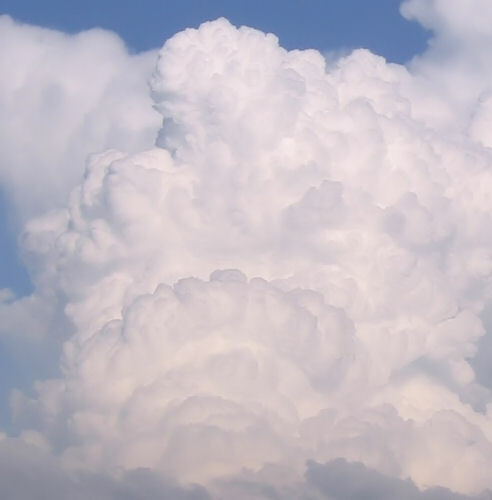 It was fascinating to watch the speed at which the top of the cloud grew in height and width. After it passed a few miles past, we took a photo with Martin. Later in the evening as the sun set, a whole new set of colors became available. 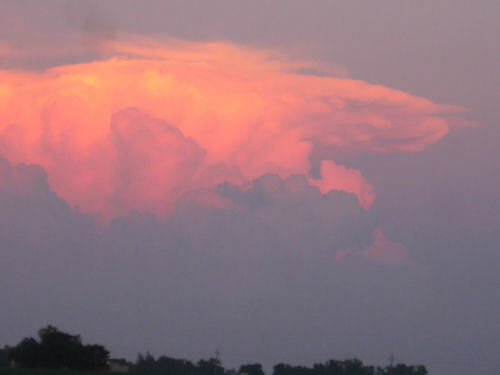 The top of the cloud flattens out as it reaches the stratosphere. This series of storms spawned a dozen tornadoes, but none of them very damaging, with only one farm damaged. Since school got out, Emma has been steadfast about running every day. 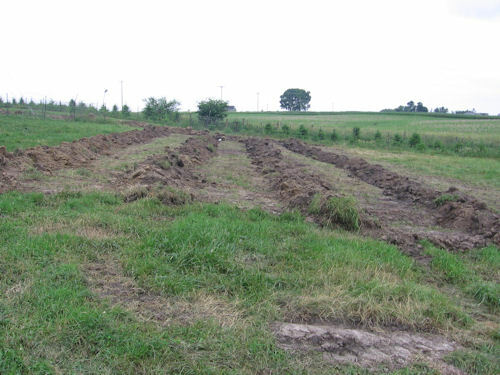 There’s a tractor path that runs a mile through the fields over to a neighbor’s, so she doesn’t have to run on the roads. The Rose Festival in State Center was today and Emma ran in her first 5k. 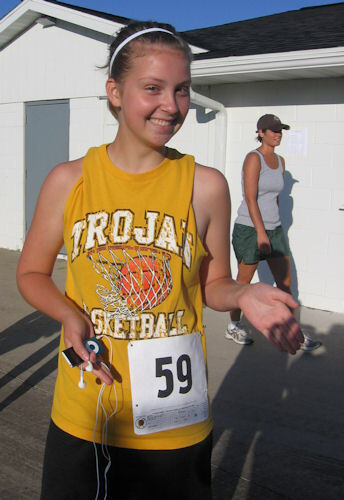 She ran hard and finished in 2nd place in her first 5k. Now she’s really raised the bar for future events! 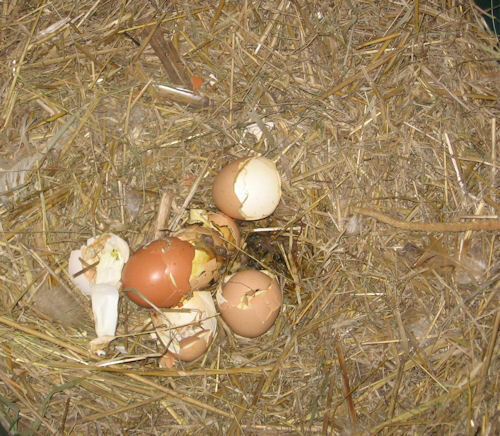 Martin had been keeping his eyes on a clutch of eggs in the barn. When we were working on the door, Martin found the eggs were all cracked. 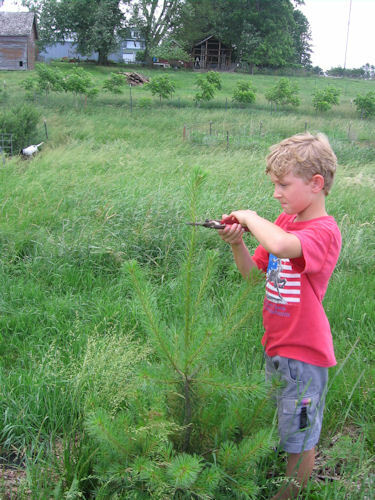 I told him to look for the chicks, because maybe they had hatched (or eaten by a critter). It didn’t take him long to find the mother and the chicks, in this case a Buff Orpington hen and five chicks. Finding a “free range” mother hen and chicks is like a combination of Santa’s presents and finding a 20 dollar bill on the street. 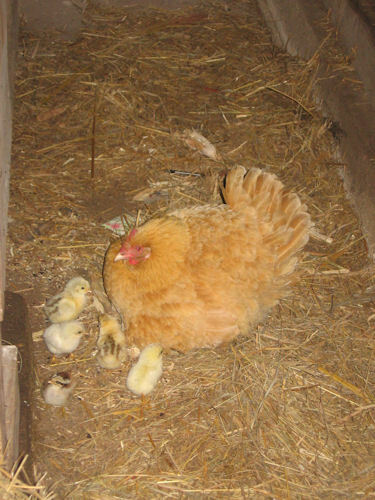 It sure beats keeping motherless chicks under a brooder.